At Its August 29 meeting, Council, meeting as the Finance and Policy Committee of the Whole (FPCOW), discussed the criteria which it uses to determine which organizations will receive benefits from the City in the form of Permissive Tax Exemptions (PTEs). 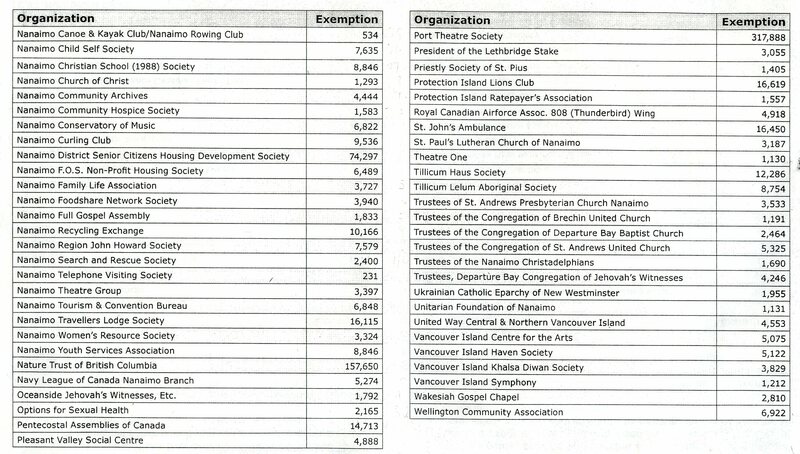 PTEs relieve these organizations from paying the property taxes which they would otherwise have to pay to the city. This gift, of course, really comes from those who are required to pay their property taxes plus the PTE difference as well. In 2010 PTEs amounted to $1,289,639. PTEs are entirely discretionary on the part of Council. PTE recipients are shown in 2010 Permissive Tax Exemptions 1 and 2010 Permissive Tax Exemptions 2. While I am sure that many if not all of these organizations are worthwhile, I am likewise feel sure that some worthy organizations have been left out. How much can we afford, remembering that “we” consists of many taxpayers who, along with their families, are already on the margin. Over and above PTEs, Council’s generosity on behalf of taxpayers provided at least an additional $1,826,846 in Grants and Contributions (G&Cs) to a number of organizations, some of which also received PTE’s. 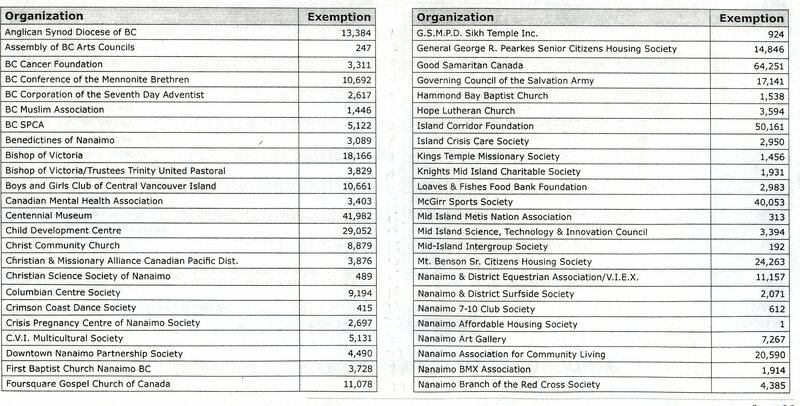 The list showing the grants and Contributions exceeding $25,000 is shown in 2010 Grants and Contributions over $25,000. Again, a worthy list of recipients I am sure, but are others left out? 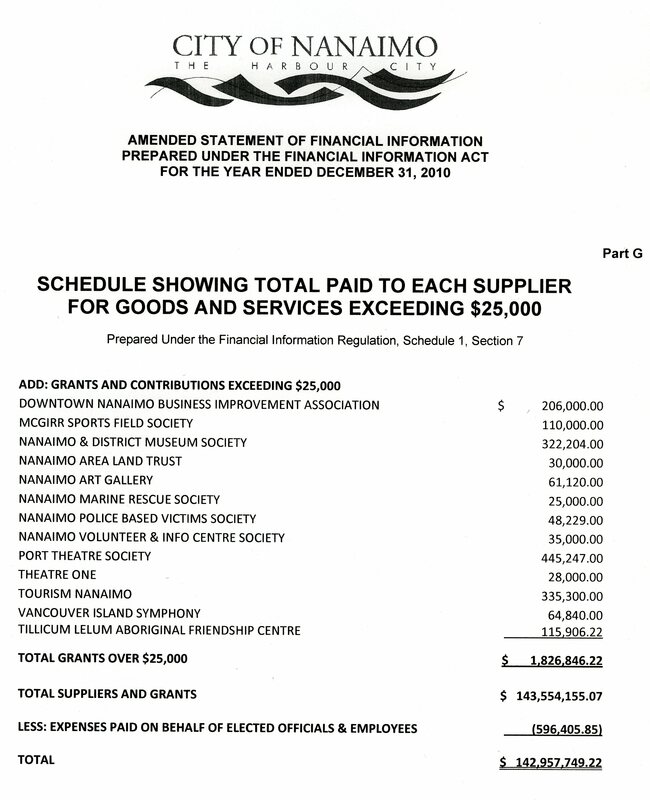 Again, before Council can give such largesse, it must collect it from Nanaimo taxpayers. Can we afford to provide financial assistance to every worthy effort while our citizens may not have enough money left over to adequately feed their families, pay school or recreation fees, etc.? Leaving out G&Cs less than $25,000 which I have been unable to compile, PTEs and G&Cs added up in 2010 to over $3,100,000. This is nearly $8,500 each and every day of the year. Before you get too carried away, this amounts to somewhat less than 4% of the amount collected by the city in Property taxes. But it also could be expressed as nearly $37 per year for every man, woman and child in Nanaimo, or over $180 per year for a 2 parent family with 3 children. The question facing taxpayers is how to assess the value obtained by the community against the value of allowing citizens to determine their own level of generosity. To what extent is such enforced generosity a core service of a city? Your observations and comments are requested. You have asked a good question. Why not give the Finance Department a call and get back to us with the answer? Can anyone explain to me why McGirr Sports Field warrants so much of my money? Why should the North End get such a huge grant and a very large tax exemption for a sports field? Are the kids so poor and underprivileged? Have they no yards? Have they no parks? Have they no streets to play hockey and basketball? Another good question. Call one of the Councillors you voted for in the last election and ask them. These are the kinds of questions which citizens need to ask of those who represent them. Then write back to fill us in. Re: McGirr Sports field – this field is used a lot by kids’ sports organizations. I know my kids played a lot of soccer there over the years. I don’t live near McGirr and neither did lots of kids who played on teams with my crew. I guess a property tax exemption lowers the yearly cost of maintaining the field etc and it provides the public with recreation space. If kids/families had to pay the full cost of sports facilities then most would not be able to afford team sports. I don’t mind helping subsidize the cost of recreation for children and families. I think that is the argument that should be met when considering property tax exemptions. What is the community benefit? Who owns McGirr Sports Field?? Jim, I believe the City owns it but it is leased and managed by McGirr Sports Society. Diane, is this society run by volunteers or do they have a paid staff? ?